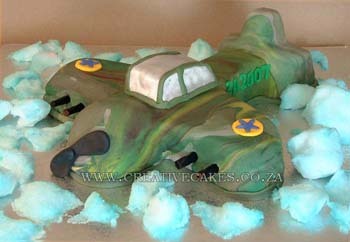 For an army, military or simply an airplane theme this airplane cake is a must for any little boy (or even old boy) who loves anything aeronautical. For a very little boy, however, the airplane cake can be colored in one of the primary colors such as yellow or red and a sugar molding of a favorite character such as winnie the pooh or barney or even a favorite toy can be inserted in the cockpit (The airplane would then have an open cockpit as opposed to the closed one featured in the airplane in this picture. )This cake incidentally is one of theose featured in great detail in the Creative cakes do it yourself e-book which is available through this website.